I have purposefully kept my business small so that I might have better control of the quality of my work. When you call Rossair Heating & Cooling Inc. for an estimate, you will get me, the owner, and not a salesman. When you call my company for a repair, you will get me, the owner. Also, since this company was built mainly from customer referrals, I have great incentive to perform an honest, quality repair. This philosophy has been very successful for me, and I hope you will give Rossair Heating & Cooling Inc. the opportunity to serve you next time you may need heating or air conditioning work. I have lived in Huntsville since 1964, and I have seen many changes in this area. I have been married to the same wonderful woman (my bookkeeper) since 1983, and I have two beautiful daughters in college. I learned this trade from my father, who ran a part-time A/C business in Huntsville in the 1970’s. This led to a job performing A/C service and repairs for the maintenance department of SCI manufacturing for 14 years. In 1995, I became state certified and started my business on a part-time basis. 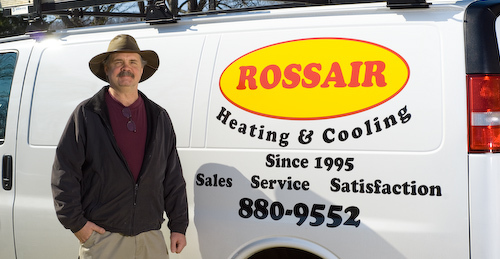 By 1998, I had built my customer base to the point where I could quit my full time job and focus on Rossair Heating & Cooling full time and since then, I have never looked back. I have taken my business in many directions since then, and I feel I have a secure, well rounded company. Today, Rossair Heating & Cooling has four employees, two trucks, and a large enough customer base to keep us busy year around. You might say my entire life has been formal and on the job training. Owner/Operator, Rossair Heating and Cooling Inc.